I have mentioned The Durutti Column a few times in the past and it has occurred to me that some readers may only know them as a reference point I use when reviewing other artists and may not have heard their music first-hand. Although they are usually referred to as a band and there are a number of regular contributors, it is essentially the long-term project of Manchester guitarist Vini Reilly. 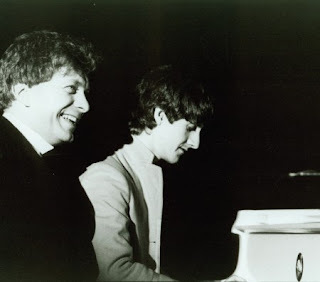 The Durutti Column were one of the first acts to sign to Factory Records and this album is a tribute to the label's founder, Anthony H. Wilson, who died in 2007. Vini has released a constant stream of albums under the Durutti Column name and while I must admit that it is perhaps not essential to own all of them, "A Paean To Wilson" is his most consistent and rewarding record in almost 30 years. The album opens with a looped sample of Tony Wilson's voice asking "Is this an art form? ", which cultured listeners will no doubt compare to the sound collages of Steve Reich, but I was reminded of "Limb", the recent compilation of JG Thirwell's early experiments. Just as it starts to become annoying, the sample gives way to a gentle layer of reverb as Vini launches into his trademark guitar playing. As always, Vini's guitar is at the heart of each track, but each time it is backed by a second instrument, such as piano, viola or trumpet, as well as some electronic interventions. These additional elements give each track a different feel; one piece is quite trippy, like something that may have been played at The Haçienda during its early-'90s peak, and at one point there is something that almost sounds like an Irish jig. While this is not something you would at first expect on a Durutti Column record, it serves to highlight the range of Tony Wilson's tastes and the wide variety of bands that he brought to the fore through his record label and TV show. As a final mark of respect, the album is mostly instrumental. Tony was always trying to discourage Vini from singing, and while I do enjoy some of the vocal pieces from his earlier works, it has to be said that he does have a weak voice, particularly when you compare it to his skill as a musician. There are some occasional female vocals here, which I think may be in a foreign language, and the only discernible lyrics have been lifted directly from Marvin Gaye's "What's Going On". It is probably apparent from some of my previous articles that when listening to a new album, I often concentrate on the lyrics to determine what the songs are about or what they mean to me. This is obviously not so easy with instrumental pieces and with a lot of Vini's work I find myself thinking about specific places or times that are conjured up by the sounds. In this case, the overall meaning of the album is apparent from the title and Vini's explanatory notes, and I was wondering if it would turn out to be quite morbid, with a focus on death. The Marvin Gaye line that is used repeatedly ("There's too many of you dying") certainly fits in with this, and Vini's playing can be mournful at times. However, the overall sound is joyous and rather than lamenting Tony's death, it suggests we should celebrate his life and everything he contributed to the music scene. The album left me feeling grateful not just to Tony Wilson, but to others who are sadly no longer around but have left a lasting impression on my music tastes, in particular John Peel and my father. If you don't want to watch the whole show then scroll to the end. At about 41 minutes in, you will find Vini and Poppy Morgan performing the album's centrepiece, "Duet With Piano". It's a shame that it's cut short after just two minutes, but this brief clip should be enough to convince you that Vini is one of the best guitarists this country has produced. For anyone inspired to check out the work of The Durutti Column, "A Paean To Wilson" is a good place to start. To those already familiar with Vini's work, this is an essential addition to his back catalogue and something I can even imagine being played at my own funeral.